Vigor2762 Series supports Stateful Packet Inspection (SPI) Firewall and flexible filtering rules, it can accept or deny packets based on the information in the packet header (such as source IP, destination IP, protocol, and port number) or the packet’s application. IP-based restrictions can be set to filter certain HTTP traffic as well as various application software and help you to prevent time and network resource wasting on inappropriate network activities. 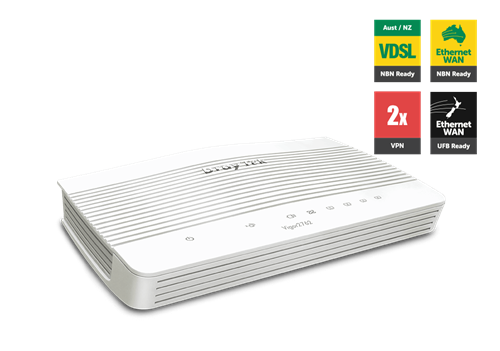 Vigor2762 Series supports bandwidth management that helps you to make the most of out of the limited bandwidth. You may set up Bandwidth Limit or Session Limit to restrict the maximum bandwidth or session number that a host can use, thus to prevent the bandwidth and the router’s resources being occupied by a single host. Quality of Service (QoS) allows you to reserve a certain amount of bandwidth for the critical clients or time-sensitive applications, and ensure their connection quality when traffic is heavy. You may classify both inbound and outbound traffic into up to 4 queues, and allocate a certain amount of bandwidth for each of the queues, there is also a simple option for Vigor2762 Series to automatically detect the VoIP traffic and classify them into the additional top priority queue, therefore to ensure good VoIP quality even if the network traffic is busy.